Since the adoption of the Directive in December 2006 amendments to the Rhine Vessel Inspection Regulation have been agreed pursuant to Article 22 of the Revised Convention for Rhine Navigation. It is therefore necessary to amend Directive 2006/87/EC accordingly. It should be ensured that the Community vessel certificate and the vessel certificate delivered in accordance with the Rhine Vessel Inspection Regulation are issued on the basis of technical requirements which guarantee an equivalent level of safety. In order to avoid distortions of competition as well as different levels of safety, the amendments to Directive 2006/87/EC must be implemented as quickly as possible. Annexes V and VI to Directive 2006/87/EC are amended in accordance with Annex II to this Directive. Member States which have inland waterways as referred to in Article 1(1) of Directive 2006/87/EC shall bring into force the laws, regulations and administrative provisions necessary to comply with this Directive with effect from 30 December 2008. They shall forthwith communicate to the Commission the text of those provisions and a correlation table between those provisions and this Directive. Done at Brussels, 22 September 2008. (2) OJ L 373, 31.12.1991, p. 29. ‘Article 2.18 — Unique European Vessel Identification Number’. ‘Article 6.09 — Acceptance and periodical inspections’. ‘Article 10.03c — Permanently installed firefighting systems for protecting objects’. In Article 2.07, paragraph 1, the term ‘official number’ is replaced by ‘European Vessel Identification Number’. The unique European Vessel Identification Number (ENI), in the following referred to as European Vessel Identification Number, consists of eight Arabic numerals according to Appendix III. The competent authority having issued a Community certificate shall enter on that Community certificate the European Vessel Identification Number. Unless the craft possesses a European Vessel Identification Number at the time of issue of the Community Certificate it shall be assigned to that craft by the competent authority of the Member State in which the craft has been registered or has its home port. As far as craft from countries where an assignation of a European Vessel Identification Number is not possible are concerned the European Vessel Identification Number to be entered on the Community certificate shall be assigned by the competent authority issuing that Community certificate. Only one single European Vessel Identification Number can be assigned to one craft. The European Vessel Identification Number is issued only once and remains unchanged throughout the whole lifetime of the craft. The owner of a craft, or his representative, shall apply to the competent authority for assignment of the European Vessel Identification Number. The owner or his representative shall also be responsible for having the European Vessel Identification Number which is entered in the Community certificate affixed to the craft. Each Member State shall notify the Commission of the competent authorities responsible for assigning European Vessel Identification Numbers. The Commission shall keep a register of those competent authorities and of competent authorities notified by third countries, and shall make the register available to the Member States. On request this register shall also be made available to competent authorities of third countries. In Article 2.19, paragraph 2, second subparagraph, the term ‘official number’ is replaced by ‘European Vessel Identification Number’. No other power consumers may be connected to the hydraulic steering apparatus drive unit. Hydraulic tanks shall be equipped with a warning system that monitors a dropping of the oil level below the lowest content level needed for safe operation. The dimensions, design and arrangement of the pipework shall as far as possible exclude mechanical damage or damage resulting from fire. to be renewed at the latest every eight years. operating and maintenance instructions for the steering system. Operation of the entire steering system shall be checked by means of a navigation test. If a rate-of-turn regulator is installed it shall be checked that a predetermined course can be reliably maintained and that bends can be negotiated safely. regularly at least every three years. a check of the optical and acoustic control devices. Directly at tank outlets the pipework for the distribution of fuels shall be fitted with a quick-closing valve that can be operated from the deck, even when the rooms in question are closed. If the operating device is concealed, the lid or cover shall not be lockable. The operating device shall be marked in red. 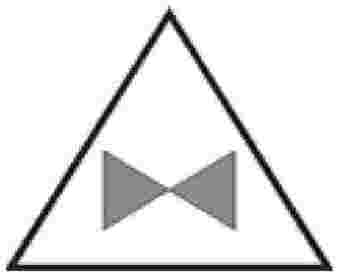 If the device is concealed it shall be marked with a symbol for the quick-closing valve in accordance with Fig. 9 of Appendix I with a side length of at least 10 cm. The last subparagraph is deleted. In point (d), the last subparagraph is deleted. In the introductory phrase, the words ‘due to persons’ are deleted. 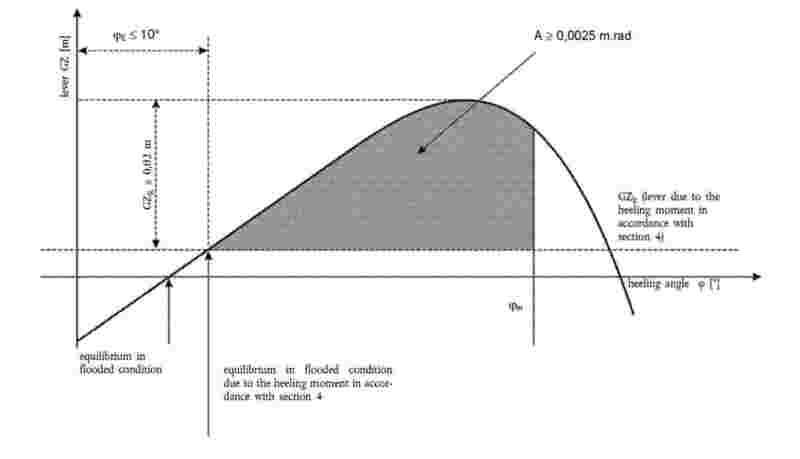 beyond the equilibrium position the positive part of the righting lever curve shall display a righting lever value of GZR ≥ 0,02 m with an area A ≥ 0,0025 m·rad. These minimum values for stability shall be met until the immersion of the first unprotected opening or in any case before reaching a heeling angle φm of 25°. The second subparagraph is deleted. Table for partitions between rooms, in which no pressurised sprinkler systems according to Article 10.03a are installed. In Article 16.06, paragraph 2, the term ‘official number’ is replaced by ‘European Vessel Identification Number’. The entry relating to Article 6.03(2) is deleted. Quick-closing valve on the tank operated from deck, even when the rooms in question are closed. For passenger vessels which were equipped with collective life-saving appliances according to Article 15.09(5) before 1.1.2006, these appliances are considered an alternative to individual life-saving equipment. Partitions according to Article 15.11(2). NRC, at the latest on issue or renewal of the Community certificate after 1.1.2045. The transitional provision applies only if alarm systems are fitted in accordance with Article 15.15(9). NRC, at the latest on issue or renewal of the Community certificate after 1.1.2045. The transitional period does not apply to passenger vessels which have been laid down after 31.12.1995, the hull of which is made of wood, aluminium or plastic and the engine rooms of which are not made of a material according to Article 3.04(3) and (4). NRC, at the latest on issue or renewal of the Community certificate after 1.1.2015. The transitional provision does not apply to passenger vessels which have been laid down after 31.12.1995, the hull of which is made of wood, aluminium or plastic and the engine rooms of which are not made of a material according to Article 3.04(3) and (4). “xxxxx” represents the five-digit serial number given by the competent authority. (1) Partitions between control centres and internal muster areas shall correspond to Type A0, but external muster areas only to Type B15. (2) Partitions between lounges and internal muster areas shall correspond to Type A30, but external muster areas only to Type B15. (3) Partitions between cabins, partitions between cabins and corridors and vertical partitions separating lounges according to section 10 shall comply with Type B15, for rooms fitted with pressurised sprinkler systems B0. (4) Partitions between engine rooms according to Articles 15.07 and 15.10, section 6, shall comply with Type A60; in other cases they shall comply with Type A0. (5) B15 is sufficient for partitions between galleys, on the one hand, and cold-storage rooms and food store rooms, on the other. (6) Partitions between control centres and internal muster areas shall correspond to Type A0, but external muster areas only to Type B15. (7) Partitions between lounges and internal muster areas shall correspond to Type A30, but external muster areas only to Type B15. (8) Partitions between cabins, partitions between cabins and corridors and vertical partitions separating lounges according to section 10 shall comply with Type B15, for rooms fitted with pressurised sprinkler systems B0. (9) Partitions between engine rooms according to Articles 15.07 and 15.10, section 6, shall comply with Type A60; in other cases they shall comply with Type A0. In Part I, box 3 of the model, the term ‘Official number’ is replaced by ‘Unique European Vessel Identification Number’. In Part II, item 2 of the model, the term ‘Official number’ is replaced by ‘Unique European Vessel Identification Number’. In Part III, box 3 of the model, the term ‘Official number’ is replaced by ‘Unique European Vessel Identification Number’. In Annex VI to Directive 2006/87/EC, in the fifth column, the heading ‘Official number’ is replaced by the heading ‘Unique European Vessel Identification Number’.